Rain fade test performed at Ka Band using a FDMA Modem and a satellite simulator. The duration of each test segment was 10 minutes. Walton's solar-winterization cover, Solar Cover was combined with an activated Ice Quake System to assess signal performance withstanding water at a rate of 2.5 gallons per minute. During this phase of the test a total of 4 hits (data lost) were recorded (see photo). 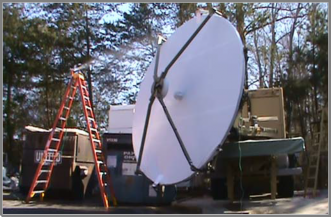 Testing was performed using a 3.9 meter GD antenna (see photo).